Hold on, because this post is likely going to be a doozy. I got most of my directions from the tutorial here. The first step is obviously to cut your shelves from the foam board. My adorable cocker spaniel wanted to help, although she's not very good with a ruler. You'll want to cut the following pieces if you are making a 7 shelf shelf like mine. Once all my pieces were cut, I spray painted one side of them (the side with the grid on it) with a turquoise colour, but this is entirely optional. I started by gluing the lips to the shelves, be generous with the glue, I mean really load it in on the inside of the shelf, because no one will see that anyway. Next, I marked with pencil on the backside of the back piece where the shelves would lie. I don't have exact measurements because I just eyeballed it until it looked even. I pushed some nails through the back piece along this line. I then just flipped the back piece over and pushed down on it to get all the nails to poke through. Watch your fingers! 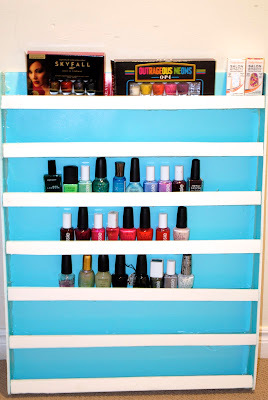 This makes it really easy to just push the shelves onto the nails and then start gluing them in place. I would place one shelf at a time, glue it, let it dry and then add the next shelf, repeat. This way you will be able to glue all the shelves without the other shelf in the way. Next put the side pieces on, you can see in the picture below that there are some gaps, I did my best to fill it in with glue, but this is why I say to cut your edge pieces a little wider. Then you would be able to trim the extra off on the back side. I also pushed some nails into the ends of the shelves just to be safe. Finish by adding some dots of hot glue on top of the nail heads on the back of the shelves so that the nails can't loosen up. Stock up with your nail polish and hang it up for everyone to see. In hindsight, I should've made a smaller shelf because I really do not have an impressive nail polish collection. Especially because most of it is at home and not with me at school.